After cutting fruits, veggies, and especially meats, it's good idea to regularly disinfect and deodorize your cutting board thoroughly. From using kitchen chemicals, to all-natural ingredients you probably have around, there are several ways to do it. For an all-natural quick cleaning, rub the cut surface of a lemon half onto the cutting board surface and scrub with a liberal amount of salt before rinsing with hot water. You can also make a paste out of baking soda, salt and water to scrub the cutting board. If the all-natural approaches aren't cutting it, you can use white vinegar, hydrogen peroxide or bleach to further clean the cutting board surface. Just make sure to rinse clean with soap and water after. Bamboo and most wood cutting boards are naturally antimicrobial and bacteria will die within 24 hours. This is not the same for plastic cutting boards which will hold on to bacteria. 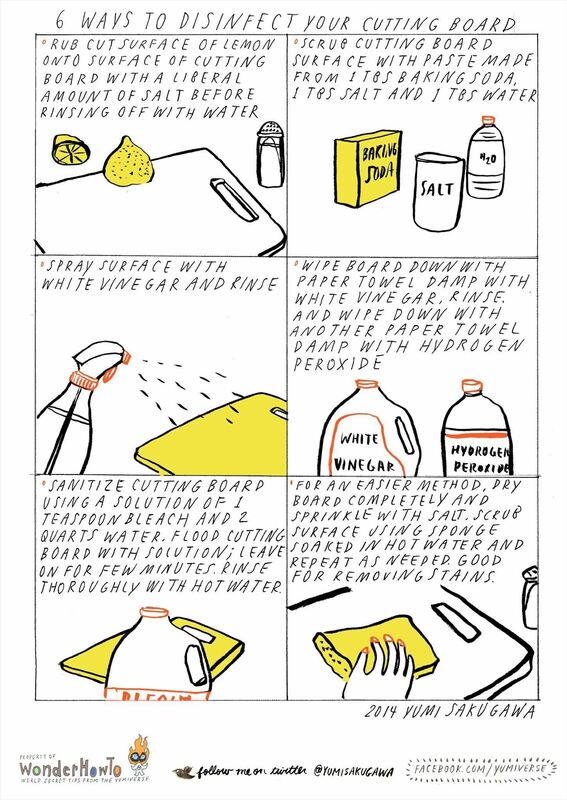 The problem with using some of the solvents recommended by this post is that you're not only "cleaning" the cutting board but you may also be drying it out as well. When using natural wood cutting board, oiling cutting boards may be a necessary part of routine maintenance in order to prevent warping or splitting. Hydrogen peroxide and salt are drying and may dry out the wood if this process is used regularly.